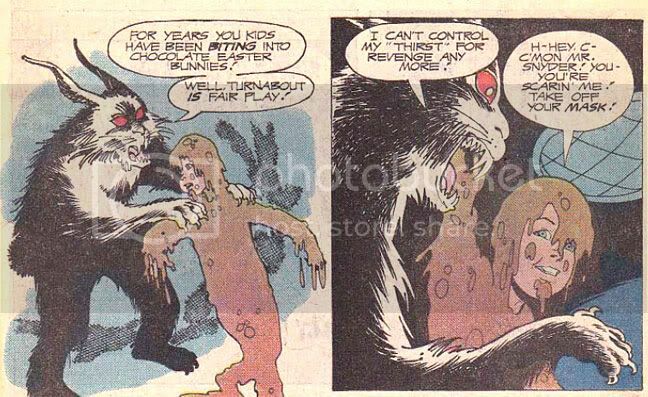 When Comic Books Ruled the Earth: 2nd Annual Spookey Month: Hoppy Halloween! Some stories just stick with you. 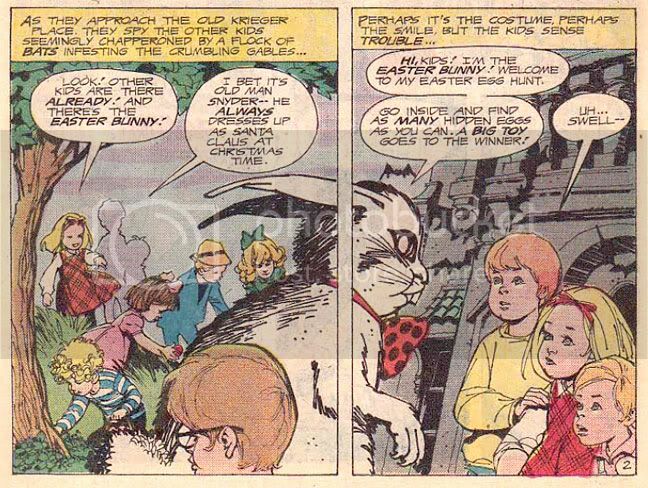 Take "Hopping Down the Bunny Trail" from DC's Unexpected #202 (1980), for example. I read this in a supermarket in Brevard, North Carolina, while visiting my grandparents. 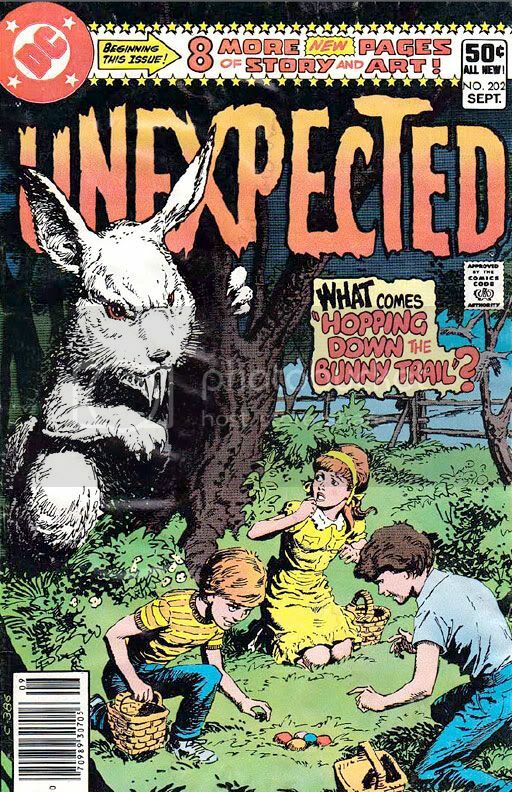 On Easter, three ordinary kids die at the fangs of human-sized, talking rabbit they mistake for the Easter Bunny, their only crimes gleefully biting the heads off chocolate bunnies and being slightly dim-witted. 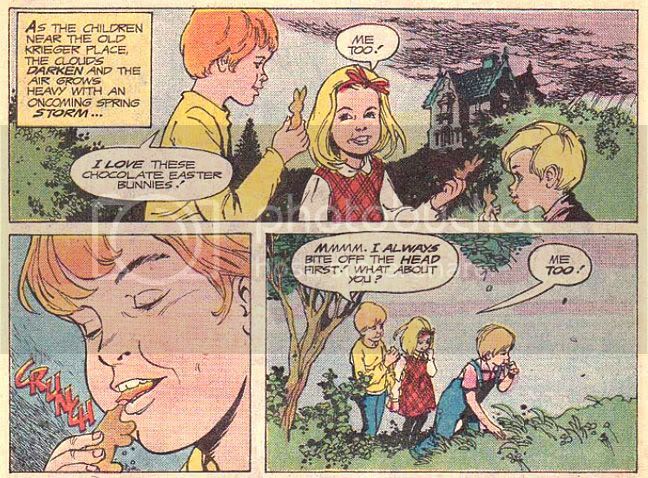 It gave me the creeps in broad daylight, and while I didn't buy the comic, it never completely left my thoughts. Through the years, I'd occasionally remember it, slightly altered over time thanks to the transformative power of an imperfect mind. Apparently, I'm not the only one who found it impressive, because someone made it into neat little .pdf with a short analysis. Finally, after 30 years, I was able to read it again. It's still a nasty little tale that should have wider acclaim. 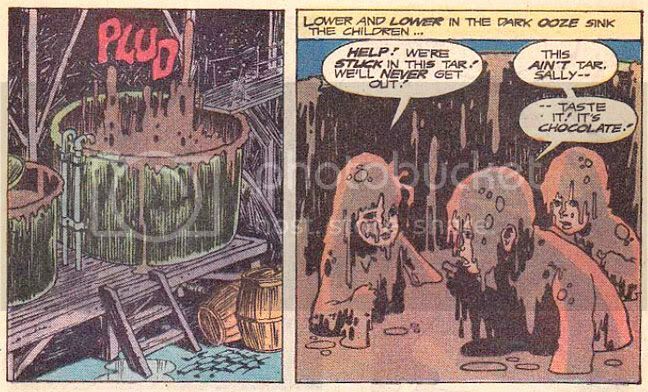 Some horror tales-- especially the ones in those old EC comics, the early Creepy and Eerie magazines and most of DC's titles-- rely on an ironic twist where some jerky moron gets his or her comeuppance. The philandering murderer can't get rid of the betrayed spouse, even in rotted corpse form; the abusive parent suffers a more horrific version of the abuse heaped on the child; the greedy boss hoists himself by his own petard, usually fatally; the blowhard suffers blowback; the foolhardy self-appointed expert destroys himself and those who foolishly believe in him. No matter what gruesomeness occurs, we're usually reassured in some way that cosmic justice has been served, scales have been balanced and the underlying order has been reaffirmed. We get a kick out of what happens at least partially because these stories play into our sense of moral superiority. But in this Michael Uslan-scripted story, the worst you can say about the characters is they're all a little dim-witted and unimaginative. The parents fail in their responsibility to protect their children because they just assume the city's somehow behind the Easter egg hunt that's been completely unpublicized until colorful signs appear overnight. Sure, it's at the local haunted house, which is probably firetrap or at the very least a tetanus shot and a lawsuit just waiting to happen. Send the kids! These jokers are pretty blase, aren't they? This was the era before the ominously narrated news stories intended to stoke every parent's more morbid prescient fantasies, before 9/11, the anthrax letters, terror alerts and Dateline NBC and Inside Edition. This was two years before the Chicago Tylenol poisonings. And yet as we've seen so many times, even today's supposedly hyper-vigilant adults slip up. They leave kids locked in daycare vans in the middle of summer, fail to recognize or simply ignore the warnings signs before school massacres, leave the gate to the backyard swimming pool unlocked. Even if they're frequently driven to complete paranoia by stories about Internet perverts, Satanic cults and poisoned candy, they-- just like the parents in this story-- can be lulled into complacency by the promise of colorful eggs and treats for the kids. After all, nothing bad ever happens on holidays! The kids are pretty dull themselves. They walk right up to the "Old Krieger Place" despite Tenny Henson's having drawn storm clouds looming over it menacingly. I suppose their imaginations have been dulled by too much mediocre television and brain-rotting Saturday morning cartoons. 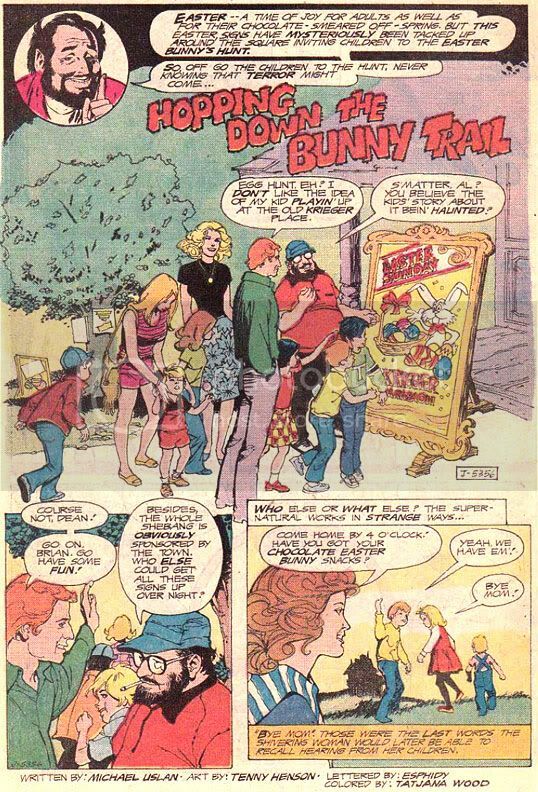 Here's a human-sized talking rabbit and rather than recognize something completely bizarre and even threatening about it-- shoot, some kids bawl at the sight of Santa Claus-- these little chocolate lovers just assume it's Old Man Snyder in a costume. That's some costume! To sweeten the deal, the Easter Bunny offers toys and candy. If that isn't a tip-off, I don't know what is. But these numbskull kids take the offer at face value. 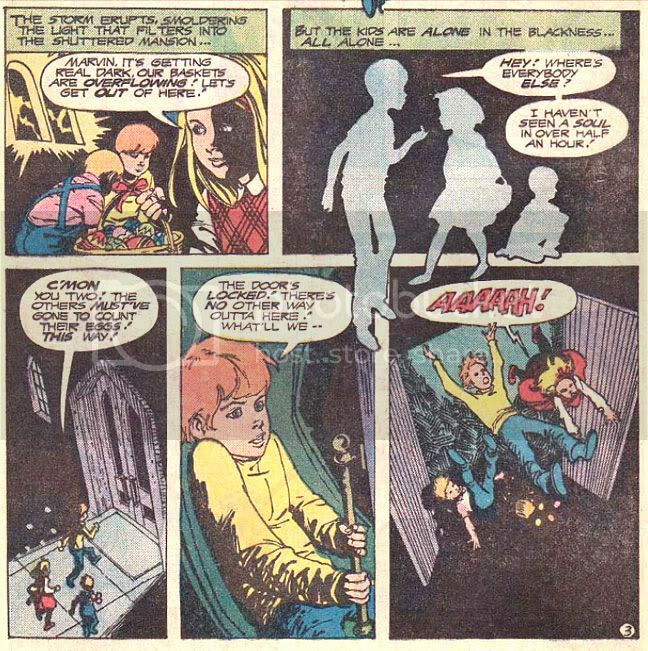 They only start to wise up when the other kids vanish and they find themselves all alone in a perfectly creepy house. And then only a little. They're so confident that everything's fine, that they're going to grow up and go to college and get married and have kids just like themselves one day. And should something bad happen, Mom and Dad will be right there to save them. Right? Well, the universe doesn't really work that way. Not only to bad things happen to good people, horrors beyond horrors happen to them. Cars and planes crash, nuclear plants leak, cancers strike, young dudes accept odd jobs from John Wayne Gacy. In the face of the ongoing tragedy we call living, we'd love to believe someone benevolent is in charge, that there's some underlying order to it. Certainly there are natural laws and forces at work. We can calculate the orbit of the earth around the sun with precision because we've figured the most obvious of them out. But they also guide bombs onto blameless schools and hospitals and bullets into innocent spines. Some horror stories offer a glimpse of a universe of limitless chaos where we are all in immediate danger. They tell us order is an illusion, that good intentions invite catastrophe. People are punished far out of proportion to their wrongs, or become victims of circumstance. You bite the head off a chocolate rabbit. A demonic rabbit bites off your head. Note the complete lack of gore. Just a transition from the brightly colored world of a sunny Easter Sunday to a dark and stormy place where wicked things happen to kids because they and their parents are careless and sort of dumb. When I was 12, I could easily imagine myself as one of these dopey kids. I was a dopey kid. "Hopping Down the Bunny Trail" lifted the lid off the field and revealed something much better hidden. And that was terrifying. Now close the comic and try to sleep. Happy Halloween! No! I can't leave you on a downbeat note like that. Here's Spookey to cheer you up again and reassure you the world's a loving place!